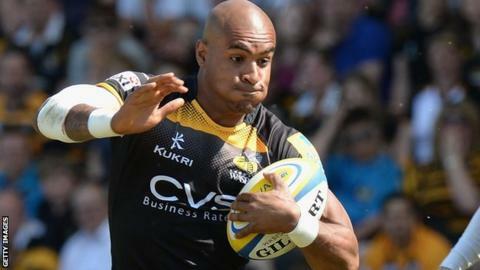 New Bristol winger Tom Varndell says he is certain the club will win promotion to the Premiership this coming season. Bristol suffered last-minute play-off heartbreak to miss out on promotion last term, but Varndell says they will use that pain to inspire them to glory. Varndell, 29, signed for Bristol from Wasps and is one of the most successful players in Premiership history with 425 points from 169 appearances. "It's going to happen this season," Varndell told BBC Radio Bristol. "We can't have another year if we miss out again. Now it's about using the pain from last year to push us forward and be a Premiership team. "Everything is in our favour to be a Premiership team, we know what we need to do and that is win and win well." Varndell admitted he did have second thoughts about joining Bristol after they missed out on promotion, but is relishing the challenge awaiting him at the club and is determined to help them reach the Premiership. "It was a big decision for me and my family but the squad is fantastic," he said. "Yes, there were question marks after that final game of the season, it was a big decision but I have 100% belief in this team that we will achieve the goals we have set out this season and be a Premiership team next year. "As players they have been in this league long enough now. On paper we should have the ability to wipe other teams away and show the intent that we want to be a Premiership team. "We've got everything going for us to be a Premiership team, so as players it is up to us to deliver that." Varndell, who is second on the all-time list of Premiership try scorers with 85, added: "The players are exceptional, they were the best team last year without a shadow of a doubt. "They are Premiership standard and as far as I'm concerned this is a year for us to prepare for being in the Premiership next season."